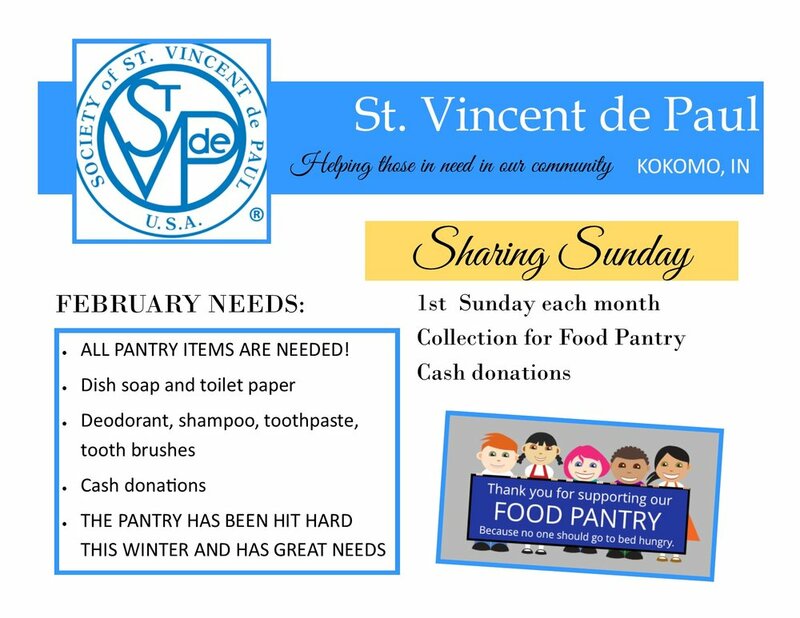 The St. Vincent de Paul pantry has been hit very hard this winter and is in need of ALL pantry items and cash donations. Please be generous to those who are in need of the basic items who live in our community! The 1st Sunday of each month St. Joan of Arc collects pantry items and cash donations to be used throughout the month at the St. Vincent de Paul store downtown. These donations go a long way to help those who are in need of the basic necessities - food, toiletries, assistance on gas or electric bills, medications, etc. There is much work done to assess the needs of those who receive assistance. Your help is greatly appreciated! St. Patrick is also involved in Sharing Sunday but their collection is the 2nd Sunday of each month. Volunteers from both parishes run the store.